The idea of Google’s Android Wear powered smartwatches working with Apple’s iPhone sounds far-fetched, right? 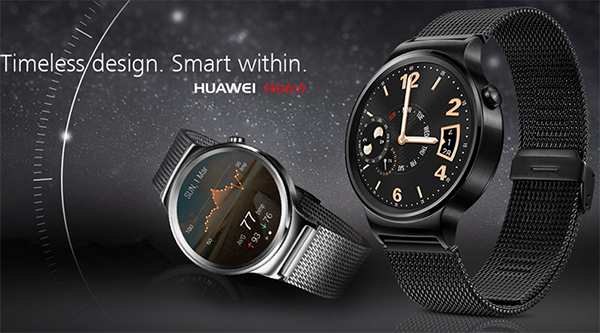 Perhaps not, because a few hours back a listing for the highly-anticipated Huawei Android Wear smartwatch (named Huawei Watch) was spotted over at Amazon which stated that the device is compatible with “most devices with an iOS 8.2…”. The page after making a few rounds on the Web has since then been taken down following a statement from Huawei. The listing was particularly interesting because it was the only source that had clearly called out the compatibility of the Huawei Watch – which is confirmed to run Android Wear – with potentially an iPhone. 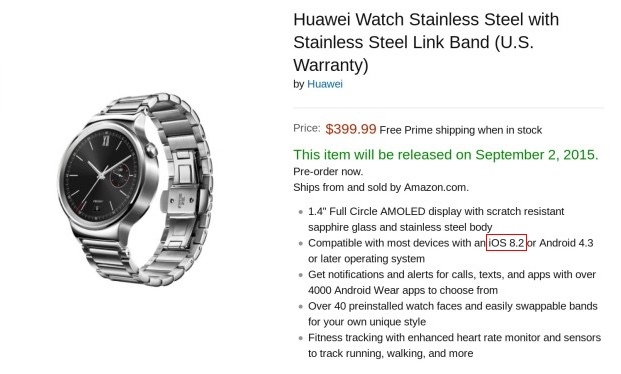 At first glance, it definitely seems like an oversight in listing – a mistake that somebody over at Amazon or Huawei committed when putting the watch up there. This would normally call for a correction, but the move to pull the page completely along with a hint to check back in a week, makes you think if someone at Huawei jumped the gun early, and if Google or Huawei had some important announcement to make in near future, especially with IFA just around the corner where a number of new Android Wear powered smartwatches will be announced, including the second-gen Moto 360. It’s been in the rumors for quite some time now that Android Wear compatibility for iOS is in the works, but there has never been any credibility to this claim. We’re beginning to think that this might be the first actual indication that it can potentially happen, and that too soon. The Huawei Watch’s preorder listing showed the base model selling for $350, and going up to $800 for gold-plated versions. Not available for pre-order anymore obviously, but the listing did state that it would be available for shipping starting September 2, which means we don’t have to wait for long now to find out if it will indeed run with iOS devices. Wow, best looking smart watch by a mile. This actually looks really good. Now that looks like a solid watch! Watches are round and it’s a Watch, a Smart Watch, it’s for telling the time first then all the other stuff that make it Smart eg notifications and fitness stuff. Telling the time is its primary function.